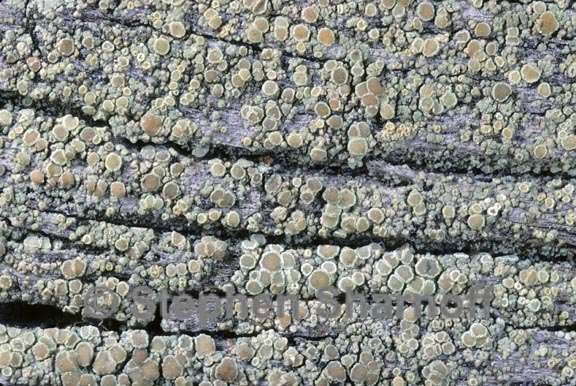 Thallus: crustose, composed of dispersed warts or warted-areolate, sometimes with a grayish white prothallus around single thalli areoles: rounded or irregularly incised, 0.05- 0.15 mm in diam., moderately to strongly convex, ecorticate but sometimes with a loose unorganised alga-free layer of various hyphae surface: yellowish green to ochre or grayish beige, esorediate Apothecia: usually densely crowded, more rarely single or in small groups, rounded to flexuose, rarely tuberculate, sessile with a constricted base, 0.35-0.60(-0.9) mm in diam disc: light ochre to reddish brown, dull, finely white pruinose, flat to moderately to rarely strongly convex, without a parathecial ring margin: yellowish beige to ochre (same color as thallus areoles, if present), dull, weakly prominent when young, persistent and ±level with disc, or often excluded in old apothecia, often irregularly incised or knobby amphithecium: present, with an algal layer, composed of hyaline, short-celled hyphae with lumina 1.5-2 µm wide, laterally 50-80 µm, basally 60-85 µm wide, corticate; cortex: 10-20 µm wide, hyphae with lumina of (1.5-)2-3 µm parathecium: indistinct epihymenium: sordid orange- to reddish brown, coloration caused by fine granules (soluble in K) and apices of paraphyses, 5-15(-20) µm thick hymenium: hyaline or rarely faintly yellow, (40)45-55 µm tall; paraphyses: hyaline, simple or weakly branched and anastomosing, sometimes with brownish apical cells, with lumina: 0.7-1.2 µm wide below and (1-)1.5-2 µm wide apically; subhymenium: hyaline, 20-60 µm thick; hypothecium: hyaline or faintly yellow, 60-95 µm thick asci: clavate, 8-spored ascospores: hyaline, simple, ellipsoid, (7-)8.7-10.8(-12.5) x (3.5-)4.1-4.8(-5.5) µm Pycnidia: not observed Spot tests: thallus K-, C-, KC-, P-;. Secondary metabolites: isousnic acid (major), ±usnic acid (minor or traces or rarely major). Substrate and ecology: often endosubstratal, in coniferous forests of higher montane regions; World distribution: North America and Europe Sonoran distribution: Arizona, southern California and Baja California. Notes: Lecanora albellula can be very similar to L. subintricata in outward appearance but differs in its slightly larger apothecia, broader ascospores, higher hymenium, and thinner marginal cortex. Apothecia of L. albellula are usually densely crowded, but tend to be single in L. subintricata. Specimens with dark apothecial disc can be confused with L. saligna and L. coniferarum, both of which have larger apothecia (> 1 mm diam. ), and a persistent, more conspicuous margin. Lecanora saligna and L. americana differ in chemistry.